Wittenborg University’s Master of Business Administration (MBA), Bachelor of International Business Administration (IBA) Programmes and Bachelor of Entrepreneurial Business Administration (EBA), are accredited by the Swiss-German Accreditation Agency, Foundation International Business Administration Accreditation (FIBAA). Since the launch of the Bologna Process, along with the transition to bachelor's and master's programmes, and the growing independence available to Higher Education Institutions (HEIs) in designing their degree programmes, the call for HEIs to establish and advance sound and transparent quality assurance systems has grown continuously. 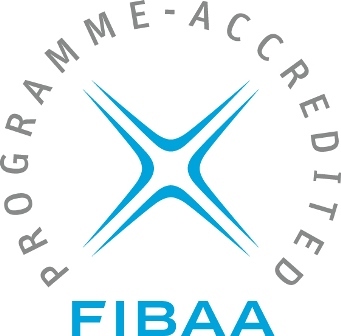 When the Accreditation System was established in Germany, FIBAA was founded in 1994 and hence became one of the first agencies to be accredited by the German Accreditation Council. Since 2002, it has been entitled to award the Seal of the Accreditation Council for degree programmes in Germany. The accreditation of degree programmes is an internationally-established quality assurance process in the higher education sector. It serves to maintain fundamental standards in terms of the contextual and structural design of education, to secure the comparability of various study programmes at national and international level, and to facilitate the international recognition of academic achievements and degrees.